There are centers of energy within your body called chakras. These spheres are constantly in movement, moving energy throughout your body. When aligned and balanced, you physically, emotionally, mentally, and spiritually feel at peace. But, as energy is constantly shifting, your chakras can move out of alignment. This post will teach you about chakras and how to achieve optimal alignment for spiritual and overall well being. To put it simply, chakras are energy centers within our bodies. They’re constantly moving and shifting. There’s many different chakra areas in your body but there’s seven major ones that we’ll focus on. This is located at the base of the spine and is our foundation. We use this chakra to be grounded and stable. It also deals with our instincts, security, and survivability. When its out of balance we may feel anxiety, hopelessness, or instability. This energy center is located in the pelvis. It involves our sexuality, creativity, confidence, and ability to accept others/new experiences. When out of balance, there may be issues of addiction, emotional imbalance, a lack of well-being, and feelings of loneliness. This area deals with out self-esteem, self-love, willpower, energy, and vitality. Problems with gas, stomach ulcers, procrastination, or a lack of confidence can occur when this chakra is out of alignment. This chakra is located in the center of the chest. ​It’s considered the connection between mind, body, and spirit; it connects the lower chakras to the upper within our body and acts as a bridge between the two. This energy center deals with love, inner peace, and connection. There’s guilt and a fear of intimacy, along with asthma, heart conditions, or allergies, when this center is unbalanced. This chakra is located in the throat, governing truth, verbal expression, and self-expression. Feelings of confinement, difficulty expressing your feelings, sore throats, and thyroid problems are signs of an imbalance. Located between the eyebrows, our third eye is the center of our intuition and focusing abilities. Problems with eyesight, lack of intuition, and hormone imbalances can occur when this chakra needs to be reopened or realigned. This chakra connects us to our higher self, Guides, deities, and universal energy and spiritual sources. It’s at the crown of the head. When unbalanced, you can experience problems with meditation, sleep deprivation, and generally feeling disconnected. How do I know my chakras are out of balance? It depends on how bad the shift is. Sometimes it’s very slight; you can’t tell that much of a difference. Maybe your pelvis feels slightly off or you’ve had to pop your knuckles today. Something small and unnoticed. But let’s say you get really sick. Your throats is burning, your eyes are watery, nose is dripping, and you’re running a fever. Although it may not be the cause, chances are your throat and crown chakras are out of alignment. Re-balancing them will help you recover quicker. When can go our whole lives without being realigned; the energy within our bodies can shift back into place. However, when we take initiative and realign our own energy, we’re taking our complete health and well-being into our own hands. You don’t have to go to a guru and have your chakras worked on for over an hour to be realigned (although that is a viable option). Re-balancing your energy can can easily be done from the comfort of your own home or while you’re going about your day. Here’s some ways you can change it! Yes, eating food can realign your chakras. But don’t break out the Ding Dongs yet! Using essential oils for balancing your chakras is one of my favorite ways to realign! But I also love smelly things like candles and oils. You can make your own perfume, candles, hair mist, or anything you can think of with these oils to rebalance yourself. Bath bombs are my favorite; plus it’s bath magic! Woo! *If you are looking to purchase essential oils, please look no further than Danielle’s doTERRA page where you will receive personalized guidance to choosing the best essential oils for your lifestyle and well-being. Please click here to shop and e-mail Danielle at realmofvibesdg@gmail.com to get started! One of the more popular methods amongst the witchy community, crystals can be used to realign your chakras or increase their vibration. 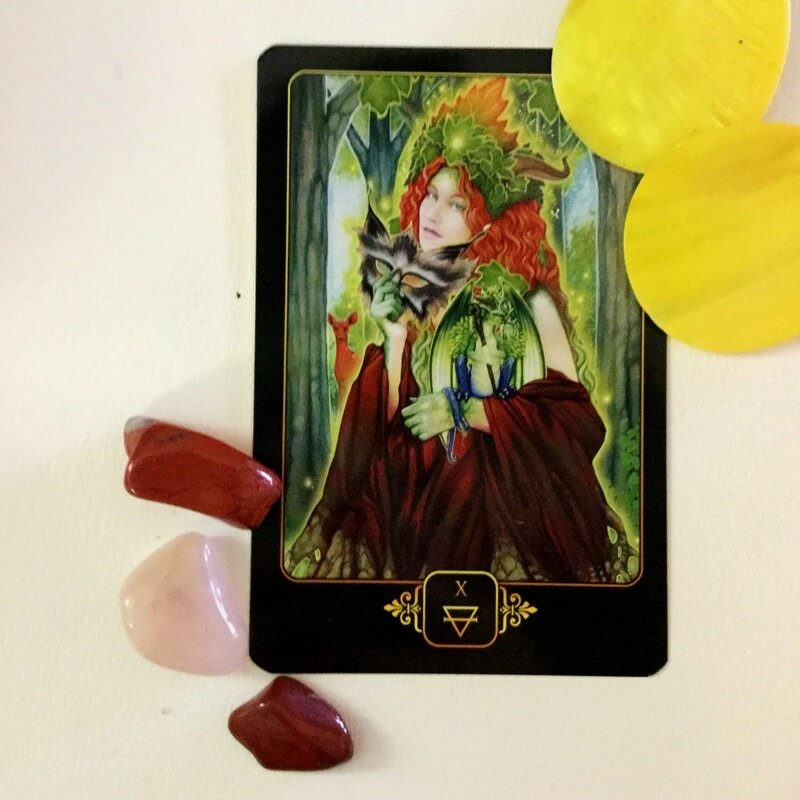 Tarot can be used to tell you the current status of your chakras and what you can do to realign yourself. This method can be incredibly personal, which is very good for realigning your chakras in everyday ways. I do offer a reading for identifying the state of your chakras and offering advice on how to fix them on my shop. 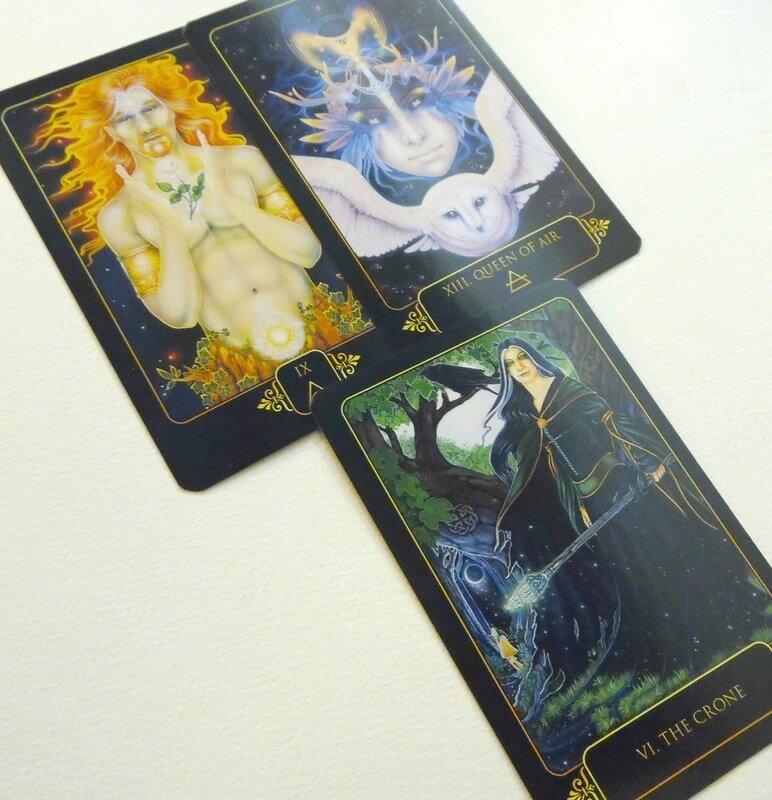 It uses the lovely Dreams of Gaia tarot (as you can see above). My absolutely FAVORITE way to balance my chakras: using my pendulum. I do this after I take a long, bubble bath and boy do I sleep great. 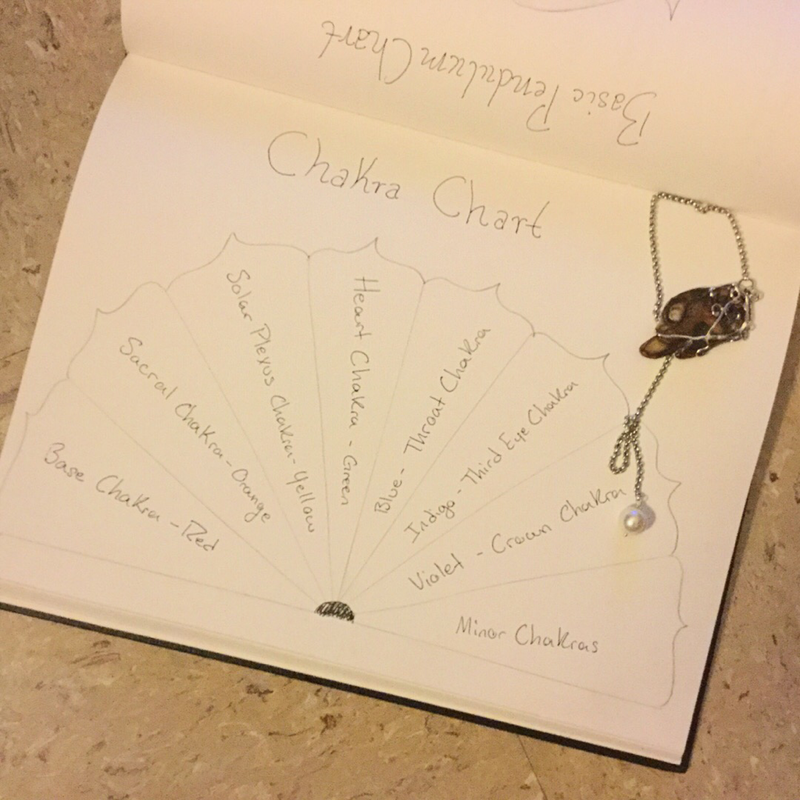 One way you can use a pendulum is to stand over someone who needs their chakras balanced, place the pendulum over each center, and ask it to realign that chakra. It will take a minute to do this; as one chakra moves into position another may move out. So be super diligent. Another way is to simply have your hand out with your pendulum over it. Ask it to realign or balance your chakras. Done! The downside to this method: you don’t know what’s out of alignment because it’s so general. My personal favorite is to make a pendulum board specifically for your chakras and have your pendulum tell you which is unbalanced and let it work on each one individually. I made one in my personal witchy journal and it works fantastic! Very much a sketch, but it works for me. And voila! There’s your introductory guide to chakras, what they are, and how to realign them in everyday ways! If you liked this article and want to share your thoughts, hop over to the Facebook group for witchlings. What do you think about chakras? What other ways can you align them? Leave a comment below! ​Until next time, stay balanced! I’m Italian, and I have a Cornicello (little horn) and Mano Cornuto (index and pinky fingers extended, thumb on top of middle and ring fingers). They are worn in Italian culture to ward away evil. The Red Jasper gemstone bracelet reminds me of my cultural jewelry, ready to protect me from lifes curveballs and craziness. Red Jasper is my support stone. It protects from evil energy, relieves stress, clears the mind, guards against physical threats, stimulates passion, and promotes healing energies. Red Jasper has come into my life during a period of change and uncertainty. All the Seeking OM gemstone bracelets serve as reminders for their intended purposes. My mind, heart, and hands are open; ready to receive Red Jasper’s guidance and protection. Disclosure: I received gemstone jewelry from Seeking OM in return for a featured post on Realm of Vibes and social media platforms. All opinions and views within are authentic. Have you considered featuring your business or service on Realm of Vibes? Please visit my Collaborate page or e-mail realmofvibesdg@gmail.com to get started. It’s unfortunate that most men in my family can’t wear jewelry to work, not even a wrist watch. My husband, a law enforcement officer, wears an indestructible watch and his wedding ring. My dad and uncles are mechanics so jewelry is not an option. On special occasions, however, the men in my life break out the jewelry, whether it be a fancy wrist watch, chain, or bracelet. When Seeking OM sent me two men’s gemstone bracelets, I was chuckling at thought of telling my husband about the concept of gemstone jewelry. He doesn’t understand chakras or crystals. It’s too abstract for him as he is a concrete, black-or-white kind of person. He has never taken a yoga class. He looked at me with one eyebrow raised as I explained to him the impact of the jewelry and the energy it releases. He jokingly said, “If I wear that thing, will it send us the energy to win a million dollars? Let me get this straight, Danielle, you have to CHARGE your bracelet under a Full Moon? Why don’t you just use that sage thing that you whirl around the house with and clean it that way?” Who knew I married a comedian? The first gemstone bracelet is the Dumortierite and Lava Stone. Seeking OM hit the nail on the head with this bracelet, as my husband’s favorite colors, black and blue (reminding us of the thin blue line). Dumortierite: promotes self-discipline, clarity and enhances focus and organizational abilities. It assists in standing up for yourself, offering patience and courage. These qualities could relate to my husband being in law enforcement. He has a lot of self-discipline, requires focus to do his job, he must stand up for himself to face criminality, and needs a lot of courage and patience to deal with what he encounters daily. Communication is very easy for him; he articulates his thoughts professionally and kindly, and is often my rock of strength. This is the perfect gemstone bracelet for him. The second gemstone bracelet by Seeking OM is Tiger’s Eye. I am giving the Tiger’s Eye bracelet to my dad. He has been surrounded by three women who believe in alternative, complimentary healing methods, so he is accepting and open to trying new things. Chakra: Solar Plexus and Third Eye: The solar plexus is related to the metabolic and digestive systems. The Third Eye provides perception before ordinary sight. My dad always tries to look at the bright side of things, even when I am having a bad day. Living with three women for most of his life, he provides balance, and is the grounding force in our family, bringing us all where we need to be to live peacefully. If you didn’t know by my previous posts, Seeking OM, is a Boston based artisan company. Their jewelry, for both men and women, can heal the 7 chakras and can empower you to be the best version of yourself. When you visit the Seeking OM website, you will be able to customize your own jewelry by stone (Howlite, Tiger’s Eye, Moonstone, Kyanite), style (plain, Buddha, Ganesh, Sandalwood, Lava stone) and size (small, medium, large). The options are endless! Although the men in my life can’t wear jewelry daily due to their professions, they can still take advantage of the benefits of crystals and gemstone jewelry when they are home or on special occasions. At the end of the day, real men wear beads.